Enjoy more living space this summer by extending into the garden. British summertime maybe unpredictable, but nothing can dampen our enthusiasm for the great outdoors. An old collapsible table and stackable chairs will no longer cut it – today, it’s all about permanent fixtures that look good all year round. Use these simple tips to help you create a idyllic outdoor living space. 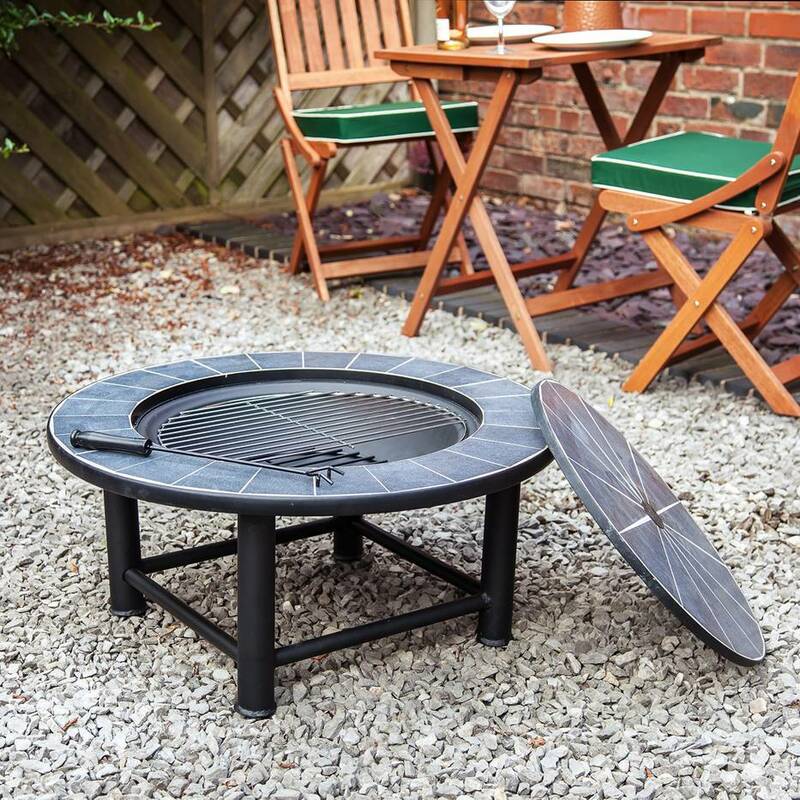 The Guadeloupe tiled fire pit table with barbecue grill is £99.99 at Alfresia. As the sun goes down and temperatures dip, keep the alfresco dinner party going with a fire pit. These are usually made from steel or cast iron and fuelled by either charcoal and wood. “This can create a great focal point, and as they come in a range of different styles and sizes, there is something to accommodate any space,” says Nic.” Some fire pits, such as Alfresia’s Guadeloupe Fire Pit Table with Baroque Grill (see below), double as barbecues – this is a fantastic way to make the most of smaller spaces, providing guests with warmth and comfort as well as delicious food. For a more traditional way to keep warm, channel the Mexican spirit with a chimenea. You’ll generally find these available in clay, cast iron or steel. Some models can also be used as BBQs, so shop around if you like to fire up a grill at the first sign of sunshine. 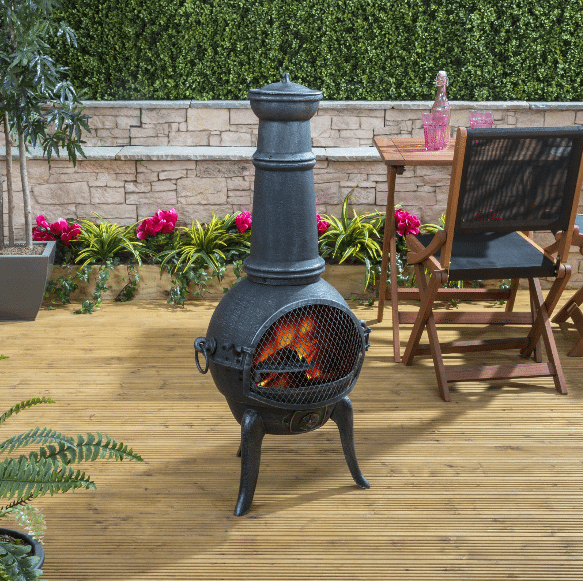 Head to Alfresia for the Madrid medium cast iron chiminea, £99.99. 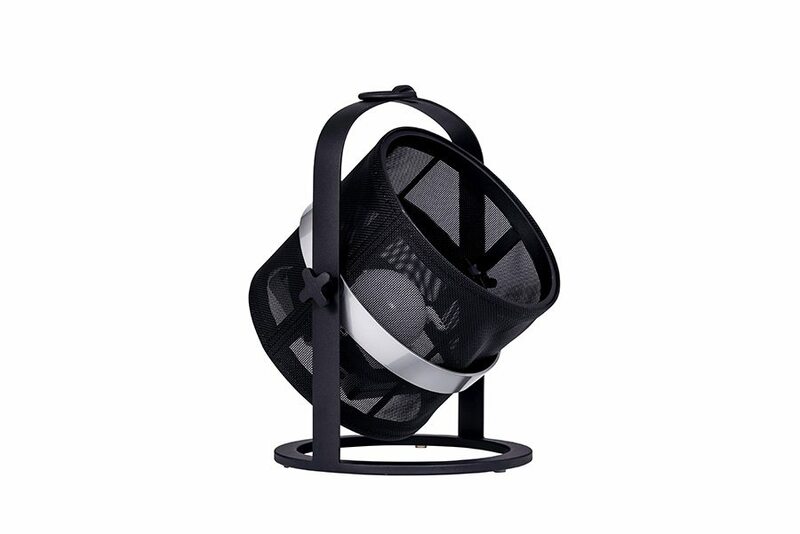 If you prefer a patio heater, there are plenty to choose from even if your space is small. Some can be mounted on the wall, or you can keep one to the table-top to keep your guests cosy. Aim for a full-sized heater if you need to warm up a larger space. You can extend summer evenings even further by keeping a pile of warm blankets close to hand. If you have wood or metal chairs, drape them over the back to soften the seat. 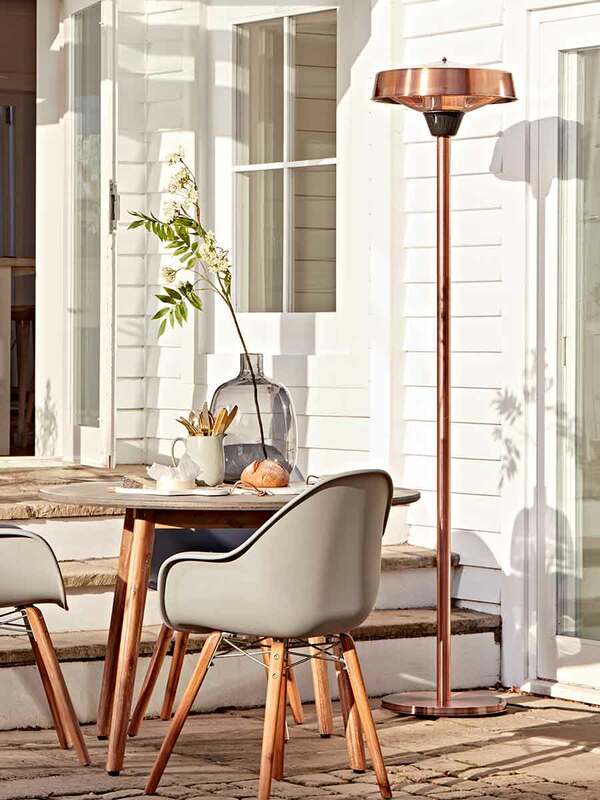 This Cox & Cox standing heater in a copper finish (£325) is a stylish addition to any outdoor space. You’ll want to be able to see your dining companions, so think about how to light your outdoor space. Why not dress your dining table with hurricane candle holders to set the mood, then line the pathway with wireless solar-powered lamps? These are an easy and eco-friendly alternative to wired-in lighting. Before you settle in for the evening, remember to check how long they’ll stay bright for so that you don’t find yourself suddenly plunged into darkness. Keep things simple by using weather- and waterproof models that you can leave outdoors all year round. The industrial-style La Lampe Petite by Maiori Design can be tilted to illuminate a particular spot in the garden. It’s priced £329 at Viva Lagoon. “Prioritise outdoor seating, as this is key to providing the perfect setting for both socialising and relaxing,” advises Nic. For smaller gardens, a freestanding or built-in L-shaped sofa can work surprisingly well, tucking neatly into a corner to use the space efficiently. If size isn’t a problem, full-on seating sets comprising sofas, matching chairs, sun loungers and day beds are widely available. Just make sure you measure how much space you have to make sure there’s enough room for everyone to chill out and move about. Six simple and affordable weekend projects will give your small garden a new lease of life. 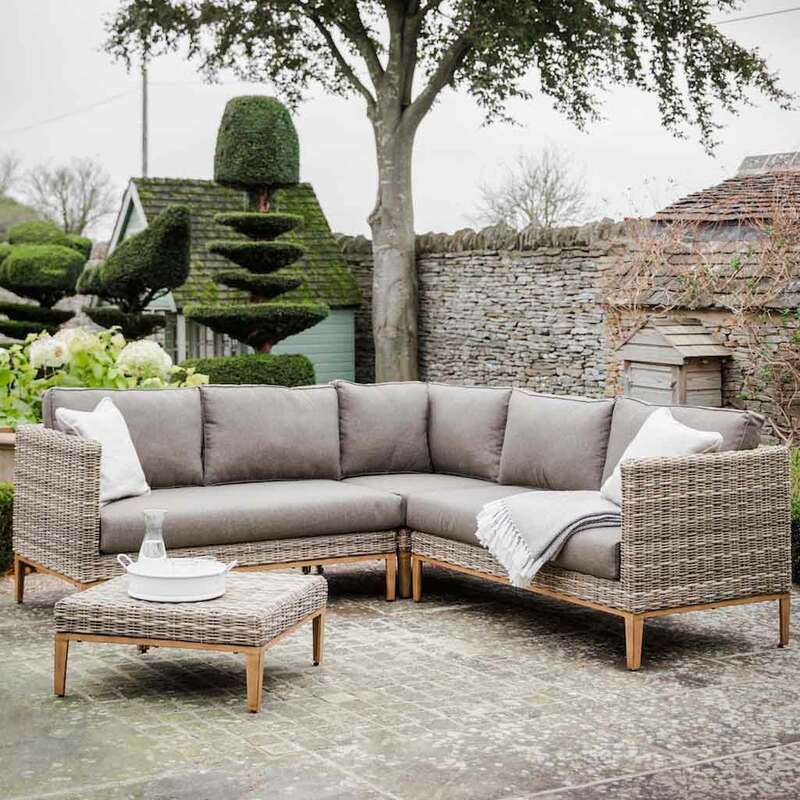 Made of weatherproof rattan weave, the Walderton outdoor rattan sofa, £1,795 at Idyll Home, comes complete with a low-level coffee table. Hang a hammock if you want to channel a jungle vibe – choose one with a stand if you don’t have two trees to tie it to. If you don’t want to hang alone, look for double or family designs. Hanging chairs are hot right now. Don’t worry if your garden doesn’t have a large tree to hang one from: many models come with their own stand. 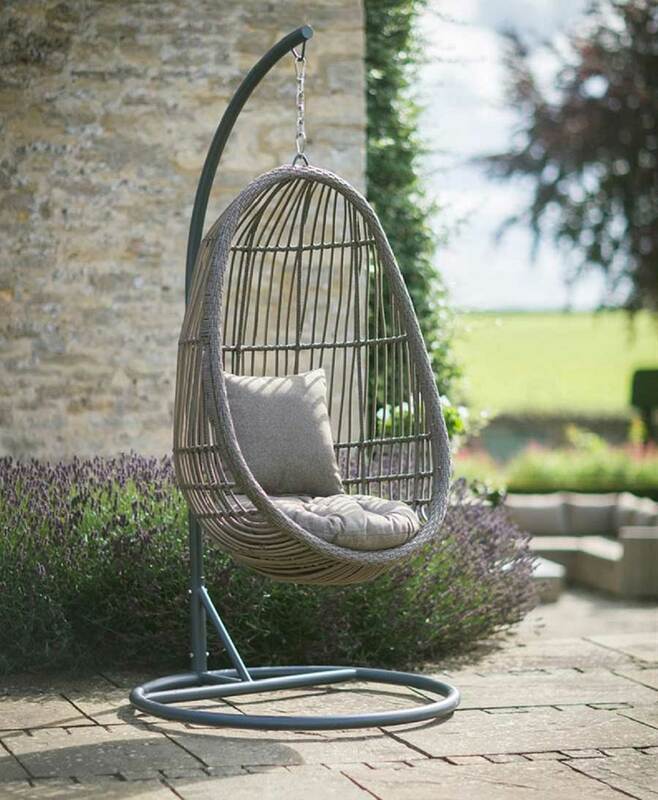 Crafted from woven rattan, the Nest chair is designed to hang from a powder-coated steel frame. It’s £325 at Garden Trading. “Opt for a stylish dining set which creates the perfect space for alfresco dining and entertaining over food,” suggests Nic. If your garden is snug, set the scene with a small foldaway table teamed with a couple of chairs. Choose a bright colour to pep up your garden after winter. Few of us have the luxury of a large garden, so it’s important to incorporate storage into your seating scheme. Benches are one space-saving solution: they take up less room than chairs and tuck neatly under the table when not in use. You could even build bench seating with storage in the base. If you have more room, there’s no shortage of large dining tables. Many are made to weather our less-than-tropical climate, so you won’t need to worry about making space in the shed during the winter months. 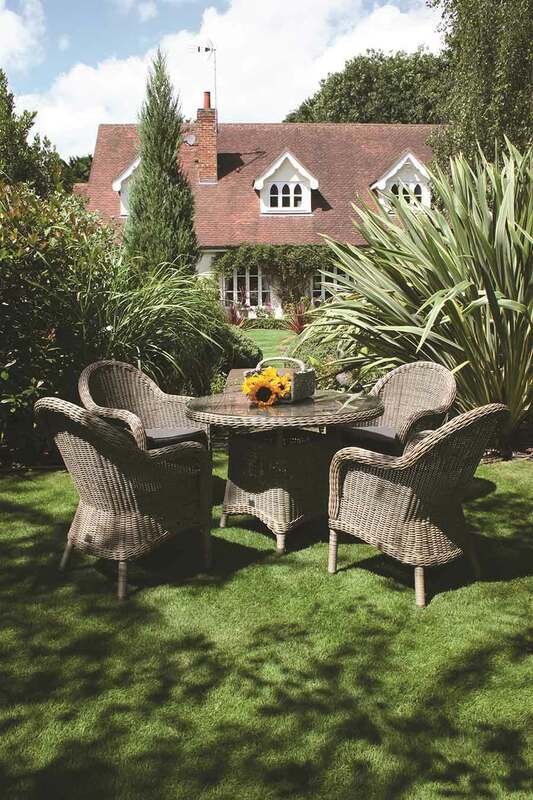 “In terms of style, rattan furniture is a brilliant buy,” advises Nic. “Not only is it strong and durable, meaning it will provide long-lasting use, but it’s also easy to clean and looks stylish too. “To soften the look, why not place cushions and throws on and over the chairs for that extra colour and texture? They’re also perfect for wrapping up on colder evenings,” Nic suggests. Ideal for small spaces, the 110cm Bali rattan dining table fits four people comfortably. Seen here with Ohio rattan dining armchairs, the set is priced £1,849 at Bridgman. Melamine picnicware isn’t just for kids. Improved manufacturing techniques mean that melamine has grown up to look increasingly like indoor tableware. It’s reasonably priced too, so, if you’re crushing on a particular colour or pattern this season, you can indulge without breaking the bank. 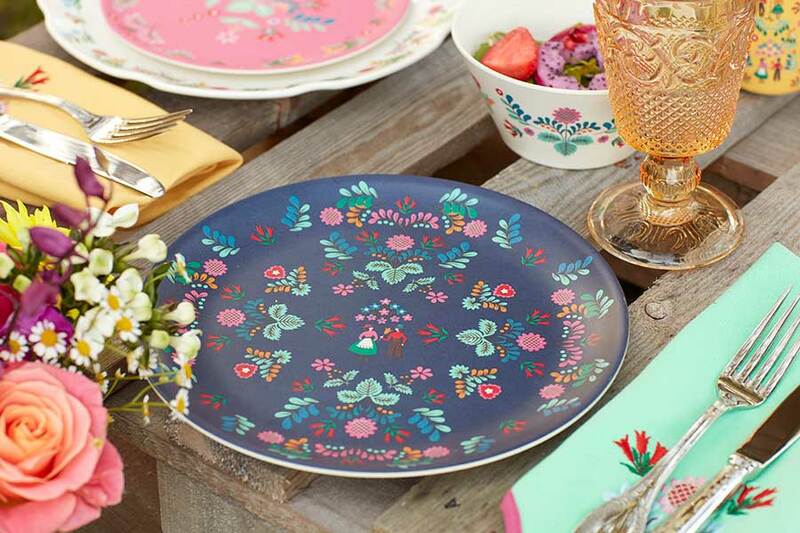 Perfect for casual alfresco dining, this Festival Folk dinner plate is by Katie Alice. Contact Creative Tops for prices. Want a cost-effective and time-efficient way to add space and value to your house? A garden room could be the answer.